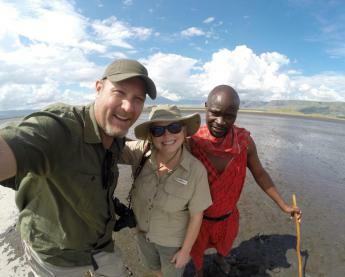 There are travelers that prefer nothing more than a large beach blanket and a deck chair...and then there are the travelers that prefer the Galapagos Lodge Adventure Tour! 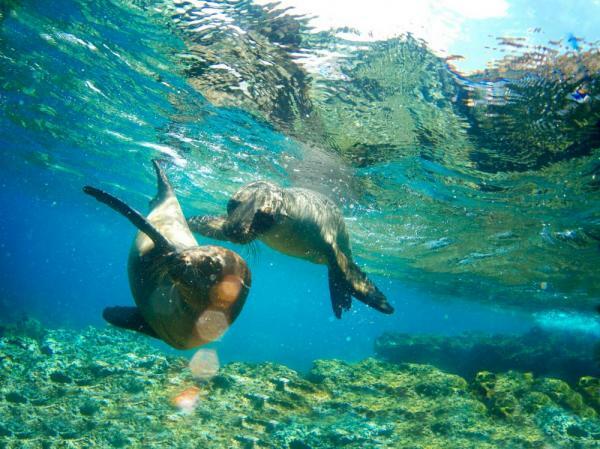 Perfect for anyone with a sense of adventure, this itinerary allows you to explore the Galapagos in a unique way. Staying in island lodges provides an intimate home base for your experience in the Enchanted Islands. There are two options for travelers to get from Baltra to Isabela: 1) One hour vehicle transfer then a 2.5 hour boat trip, or 2) A 30 minute flight. Neither of these transfers from Baltra to Isabela Island are included in your tour cost. Please see approximate costs under Dates & Prices. You will be picked up from the dock or the airport and transfered to Scalesia Lodge - your home on the island. This area is known for its solitary beaches, lava tunnels, and natural pools where you can view flamingos and other birds. 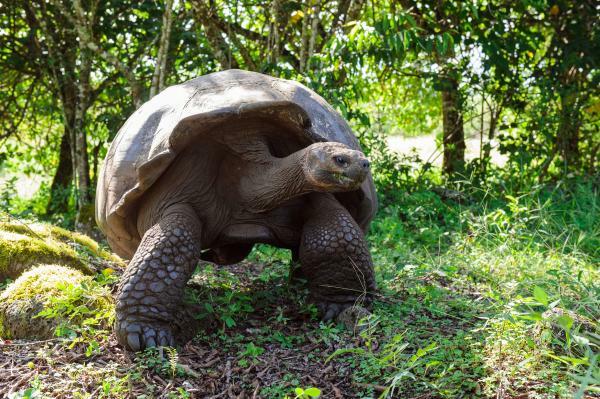 This afternoon you will visit the Tortoise Breeding Station, a center created to protect the Giant tortoise. 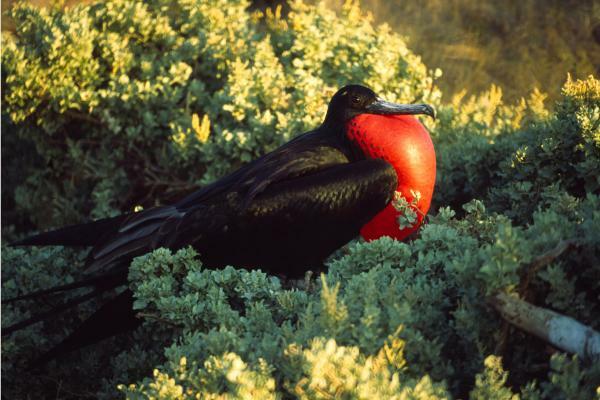 Return to the lodge for dinner and your first night in the Galapagos Islands! Today you will experience two of Isabela's best attractions. Sierra Negra is one of the most active volcanoes of the archipelago, and its crater is considered one of the largest in the world! Volcan Chico is the youngest flank of Sierra Negra, which you will have the opportunity to walk along. During this walk along the crater, you will have spectacular views of the barren volcanic floor where old and recent volcanic flows contrast in different shades of black basalt. Enjoy a snack served alongside the rim, and take in this unreal experience. After your volcano adventures, enjoy a visit to Sucre's cave and Mirador de Mango. From here, you will have panoramic views of southern Isabela and the agricultural region of the Island. This is also a prime location for finch bird observation. Return to Scalesia Lodge for dinner. A 40 minute ride on a speed boat will take us to a unique place where lava flow and the ocean waves have interacted over time. This has formed the interesting tubes and bridges of Los Tuneles. This site is also a haven for marine life - white tipped reef sharks, green sea turtles, sea lions, manta rays, parrot fish, among many others. The clear, shallow, calm waters are the perfect place to snorkel. You may also find a number of animal species that have taken up residence in the magnificent lava formations! Return to Scalesia Lodge for lunch and an afternoon free to enjoy the magical beach of Puerto Villamil. Guests can also arrange biking, surfing, or kayaking excursions this afternoon for an additional cost. Enjoy a visit this morning to the Wall of Tears. This interesting historical site, which towers 65 feet high and runs over 300 feet long, was constructed between 1945 and 1959 by prisoners in the penal colony on the island. 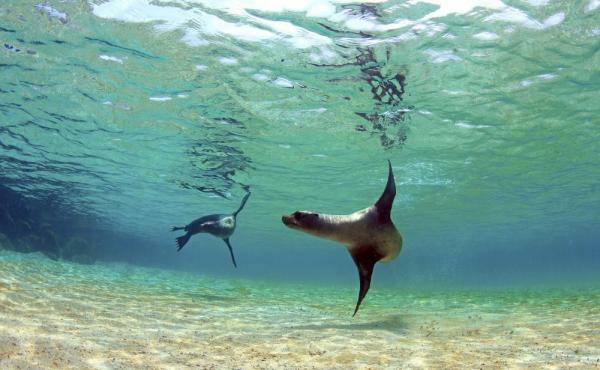 This afternoon, you will enjoy snorkeling among wildlife in Concha Perla. The bay's calm waters are ideal for finding and observing the incredible array of local marine life. You may see tropical fish, penguins, turtle, and up to 20 different bird species. Guests can also arrange biking, surfing, or kayaking excursions this afternoon for an additional cost. Tintoreras is a group of islets reachable only by boat. Once there, walk alongside a maze of narrow lava crevices, broken lava flows, sandy beaches, and stunning coves. 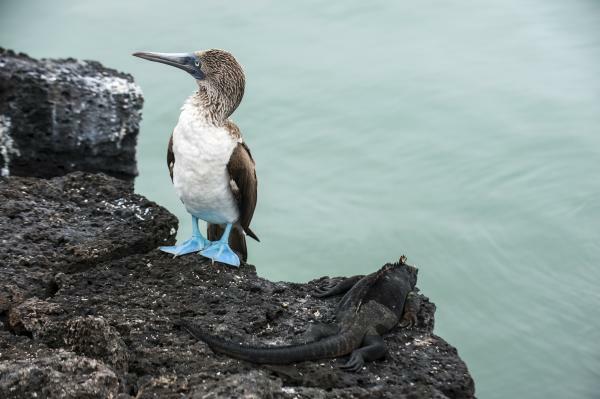 The wildlife here ranges from basking marine iguanas, perched boobies and pelicans, Galapagos penguins, turtles, and white tipped sharks (locally known as tintoreras). Enjoy lunch at Scalesia Lodge before an afternoon at your leisure. Enjoy free time at the Puerto Villamil beach, or arrange biking, surfing, or kayaking for an additional cost. Early this morning, you will be taken either to the dock or airport for a boat ride or flight back to Baltra. (Your mode of transportation is optional at the time of planning your trip.) Upon arrival, you will be taken to your "home" in Puerto Ayora - the Finch Bay Hotel. Today you will navigate one of these islands: Bartolome Island, Santa Fe Island, Plazas Island, or North Seymour Island. After a full day of adventures, overnight at Finch Bay Hotel. 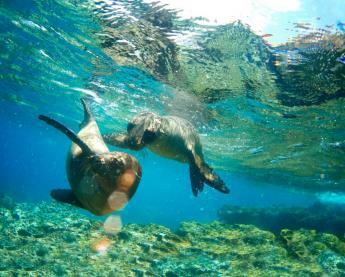 AM: Bartolome offers one of the most emblematic sceneries of the Galapagos Islands. A 600 – meter pathway complete with stairs and a boardwalk will take you to the highest point of the island where you will be able to learn firsthand about the volcanic origins of the Galapagos Islands. 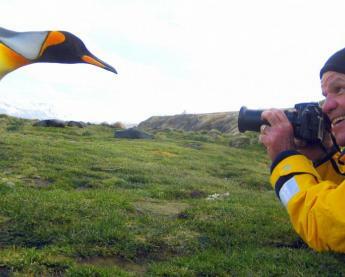 After the walk a dingy ride along the coastline will give you the opportunity to see the Galapagos penguin. This curious bird nest amongst the fissured lava flows and ventures into the crystal clear waters of Bartolome to fish. AM: Santa Fé offers a beautiful bay where the yacht anchors and where the visit of the island begins. 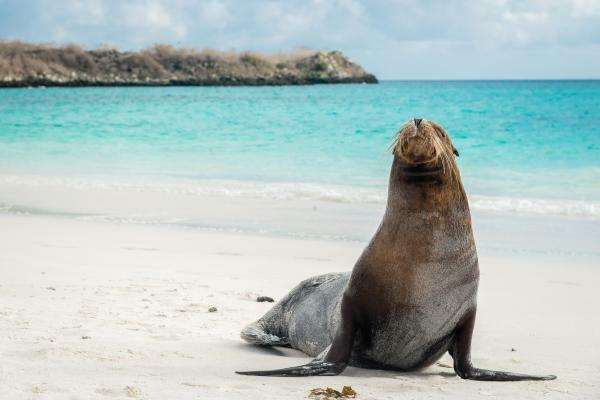 You will disembark on a small sandy beach where you will be able to see a colony of sea lions and the possibility of seeing the Galapagos hawk. Following the trail, the endemic species of land iguanas from the island of Santa Fé wait beneath the large opuntia cactus to eat its fallen pads or flowers. 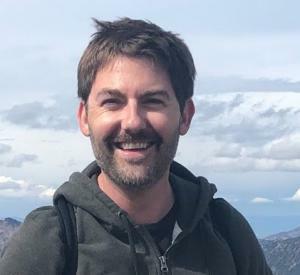 PM: Located a few hundred meters away from the Eastern cost of Santa Cruz Island, South Plazas and North Plazas islands were formed from uplifted seabed, giving it a tilted tabletop quality. You will disembark on South Plazas where you will be greeted by a colony of sea lions. Further up the shore a carpet of scarlet sesuvium succulents serves as groundcover for a grove of luminescent green prickly-pear cactus. Yellow-gray land iguanas sit beneath, waiting patiently for pears to drop. After breakfast, a short flight takes you to the Baltra airport for your departure flight. Goodbye Galapagos!